To see cookies that the site sets and how to disable, click here. Visiting this link will set cookies unless you subsequently disable them. What is included in your rate? The duration of your rental is too long for your selected pickup location. The currently selected locaton has a maximum duration of days. Does your driver have a #1 Club number? If you are a regular customer we recommend that you log in now so that we can better serve your needs. Would you like to log in or register now? Please note that from 15 Nov to 15 Apr many cities are required by law to restrict the circulation to only vehicles equipped with snow chains or winter tyres. For a summary of the orders, please visit www.poliziadistato.it. To comply with the regulations, in specific locations subject to this requirement, vehicles are equipped with snow chains - the price is included in the rental charges through the cost of 'Winterization Fee'. At pick-up if you decide to bring your own snow chains or do not intend on driving on the roads subject to this requirement, you may decline the equipment by signing the appropriate release form. This change will be reflected in the rental charges. For more information on the fees, please click here. In all other regions, we recommend that you check before renting if your journey includes one of the roads subject to this requirement and therefore reserve the snow chains, if necessary. Located in the south west of France, Toulouse is a large metropolis that boasts a rich cultural life, with many museums, galleries and examples of historical architecture. If you’re interested in the Middle Ages, take a look around the Musée des Augustins; once a monastery, it dates back to the 14th century and now houses many medieval treasures. The Basilique Notre-Dame la Daurade with its Black Virgin statue is one of the city’s many churches. You can also wander around the impressive Capitole Plaza and see the Théâtre National du Capitole. You can enjoy a boat tour on one of the city’s many canals, such as Canal du Midi, or relax in one of the parks. If you like Japanese gardens, pay a visit to the Jardin Compans-Caffarelli, which also has a lake. 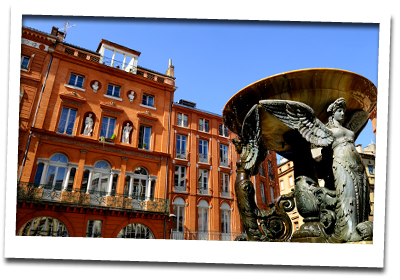 Toulouse has many fine restaurants, and its night time entertainment scene is lively and varied. You can choose from a wide selection of bars, clubs, live music and theatres, amongst other attractions. You will need to hire a car to make the most of your holiday in Toulouse. You can use your Toulouse hire car to drive to the fascinating medieval town of Albi or the Pyrénées region, which is packed with places to visit, including the world-famous shrine of Lourdes. If you hire a car in Toulouse, you’ll also have the freedom to explore further afield and spend a few days in a different location such as Montpellier or Paris. You can also load your hire car up with ski equipment and drive to the ski resorts in the Ax Valley. Toulouse’s main airport is the Toulouse-Blagnac International Airport (TLS). You can hire a car here for use as soon as you step off the plane. ® REG. U.S. PAT. OFF. © 2015 Firefly Rent A Car LLC. Firefly is a trademark of Hertz System, Inc. All rights reserved.